Odell has led a financial turnaround at Volvo. Volvo Car Corp. CEO Stephen Odell will become CEO at Ford of Europe as part of sweeping changes at both automakers that will coincide with Ford's pending sale of Volvo to China's Zhejiang Geely Holding Group Ltd, the automakers announced today. 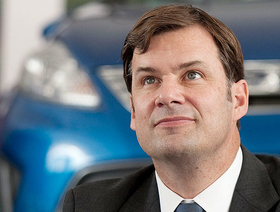 Ford also announced that Jim Farley will become the company's first head of global marketing, sales and service. Odell, 55, will succeed John Fleming, 58, who will continue to serve as Ford's head of global manufacturing and labor affairs. Odell was appointed Volvo CEO in October 2008. Since arriving he has led a successful financial turnaround at Volvo. Before he joined the Swedish automaker, Odell was Ford of Europe's chief operating officer, responsible for product development, manufacturing, purchasing, and marketing, sales and service operations. 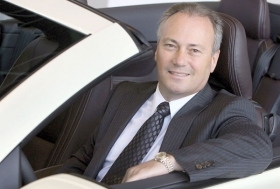 London-born Odell joined Ford in 1980 and had stints as Jaguar North America's head of sales and marketing, and as Mazda North America's chief operations officer and president of Mazda Europe. Fleming was named CEO of Ford of Europe in 2005 and added the title of chairman in October 2008. He took on the added responsibilities as Ford's head of global manufacturing and labor affairs in December 2009. He keeps that job and will be based at Ford's headquarters in Dearborn, Michigan. While holding the dual roles, Fleming was required to spend half his time in Dearborn and the other half at Ford's European base near Cologne, Germany. As global manufacturing boss, Fleming oversees the operations of 80 assembly, stamping and powertrain plants around the world and also is responsible for the company's worldwide engineering support for stamping, vehicle and powertrain manufacturing. He joined Ford in 1967 at the company's Halewood factory near Liverpool. Under Fleming, Ford of Europe has gone from being a chronic money loser to a consistent profit maker. “During the past five years, John's strong leadership has been critical to Ford of Europe's continued product and financial resurgence,” Ford Motor Co. CEO Alan Mulally said in a statement. Volvo's chief financial officer, Stuart Rowley, will join Odell at Ford of Europe as the unit's new CFO. Rowley, 43, will take over for Bryan Myers, who has served as acting CFO since late 2009. Myers will return to his previous role as Ford of Europe's controller for marketing, sales and service. Volvo has not revealed who will replace Odell and Rowley, but did announce today that Geely Chairman Li Shufu also will become Volvo chairman and that former Volvo CEO Hans-Olov Olsson will become vice chairman. All those changes will take place once the sale of Volvo to Geely is completed. The deal is due to be finalized later this quarter, the companies said. Ford also said that Farley, who currently is group vice president of global marketing and head of the company's operations in Canada, Mexico and South America, will add responsibility for global sales and service to his global marketing role. He is the first person to oversee all three areas worldwide for Ford. Farley joined Ford in November 2007 from Toyota. Farley, 48, whose grandfather worked for Ford in the early days of the automaker's history, joined Ford in November 2007 from Toyota Motor Corp., where he was general manager of the Lexus brand. Due to Farley's promotion, Ford is reorganizing its operations in Canada, Mexico and South America. Eduardo Serrano, 50, currently president and CEO of Ford of Mexico, will become executive director of Latin America with responsibility for the company's operations in Mexico and South America. David Mondragon will continue as president of Ford of Canada. Both Serrano and Mondragon will report to Mark Fields, Ford executive vice president and president of the Americas. The changes take effect Aug. 1.